The International Holocaust Remembrance Alliance (IHRA) adopts a working definition of antisemitism on 26 May. The consensus decision on the adopted decision was reached after in-depth discussion of the issue during the IHRA Plenary meetings held in Bucharest from 23-26 May. The Chair underlined the fact that as a body of 31 Member Countries, ten Observer Countries, and seven international partner organisations, with a unique mandate to focus on education, research and remembrance of the Holocaust, the IHRA was the appropriate body to adopt a working definition of antisemitism. The IHRA Chair noted the fundamental role that the German OSCE Chairmanship-in-Office played in facilitating the adoption of the working definition. 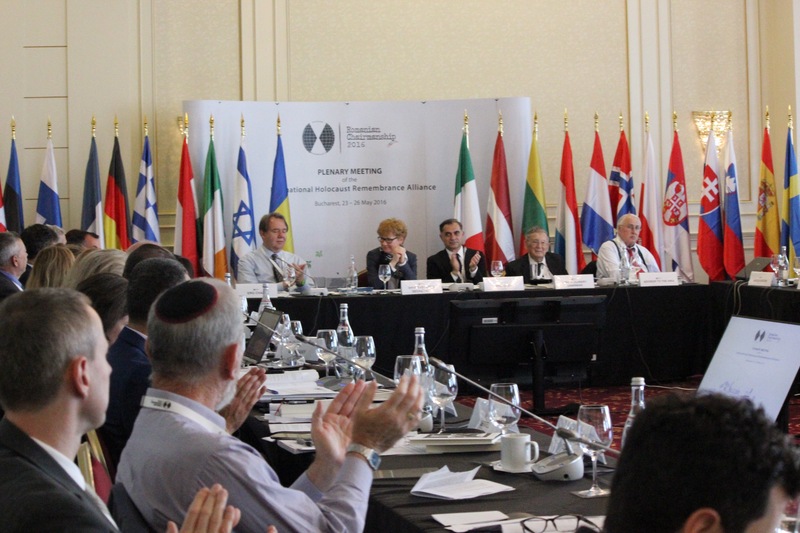 The IHRA held its first bi-annual Plenary meeting under the Romanian Chairmanship from 23-26 May 2016 in Bucharest where over four days around 200 experts and policymakers from all over the world met to discuss the Holocaust as a contemporary political issue. The IHRA’s Committee on Holocaust Denial and Antisemitism was set up in order to form a common approach to address the upsurge in antisemitism and Holocaust denial and trivialization. The Committee on Antisemitism and Holocaust Denial is tasked with assessing the situation and submitting to the Plenary annual recommendations on measures to be taken to fight antisemitism in all its different forms. IHRA is a unique intergovernmental organization which places political and social leaders’ support behind the need for Holocaust education, remembrance and research both nationally and internationally. If you would like to cover the IHRA Plenary meetings or the working definition of antisemitism covered in this press release, please send an email with details of the media outlet you work for to the email address below. Download the pdf press kit here.